Yesterday I was a poorly person, I could barely stand up out of bed and after a brief sojourn downstairs and a few sips of tea, back to bed is where I went. My knight in shining armour (aka Stephen) spent the morning at home, went into the office for a couple of hours then came home again all hero of the hour and sent my pathetic self back to my bed for more rest. Of course that meant working until midnight but he didn’t mutter a word of complaint. Not only did he take care of everything while I slept but he also came up with a fun homeschool project to do with Huwyl. 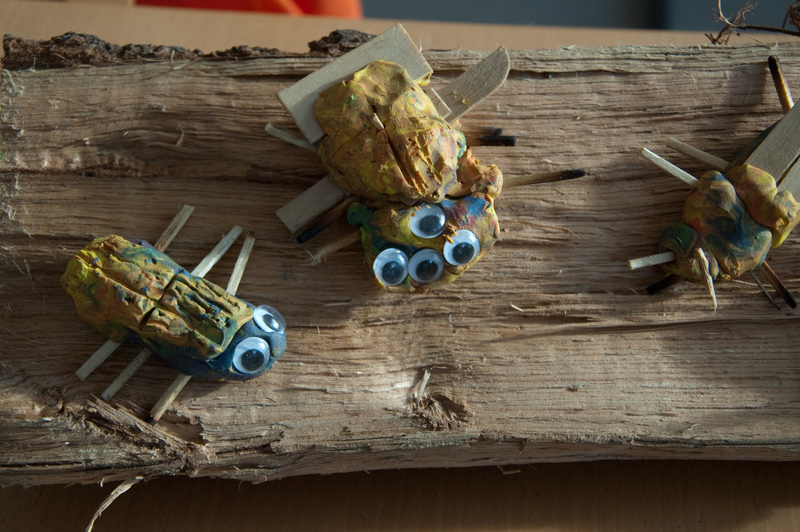 They did some research on bugs and then made a load of their own creations out of plasticine and lolly sticks. So not only did he do my job, he did it better than me. So there you have it, a wonderfully creative, fun and educational project all at the drop of a hat. Brilliant. And in case you are wondering if I am jealous of my beloved’s ability to make up super awesome projects with no seeming effort whatsoever I say unto you, no way! Because I, and this is the crucial part my friends, I bought the supplies in the first place, without that it would all come to nothing. Yep. Total credit. Secure as anything. Yep. Totally. So a big ‘thanks for keeping me alive and stuff’ to Stephen, couldn’t do it without you. Wouldn’t want to try. Can I have a new garden shead please, 12’x10′ would be luverly. “Right, you go round the front and distract this intruder and I will bomb him”. “I never, I just said I might miss him and hit you. Whoops, shouldn’t have said that”. 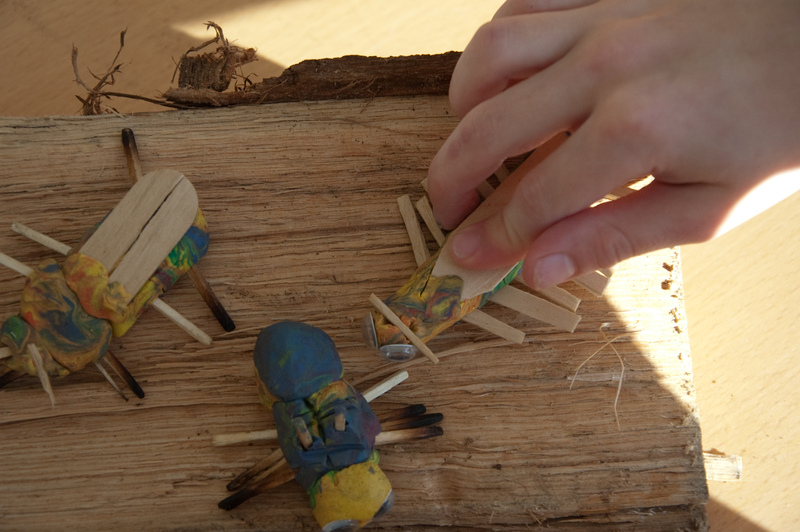 Yellow Bug picks up Hand Bug, and with a perfect rugby drop kick hoofs him into the plasticine bucket at the foot of the table. “Great shot” says Blue Bug. Looking at Blue Bug with admiration he says “Let’s fly off and make little bugs together”. Yellow Bug turns to him and says “Oi mush I’m not like that” and drops kicks Blue Bug into the bucket too where he lands on Hand Bug. Hand Bug who is like that says “I never knew you were one of us”. He grabs Blue bug and they fly off to the land of Vaseline and live happily ever after. I am contacting the authorities, no more alone time for you. No please don’t make him stop. I had suspicions about Hang Bug even when we were making him. Em, home school is soooo easy. Don’t understand what all the fuss is about. 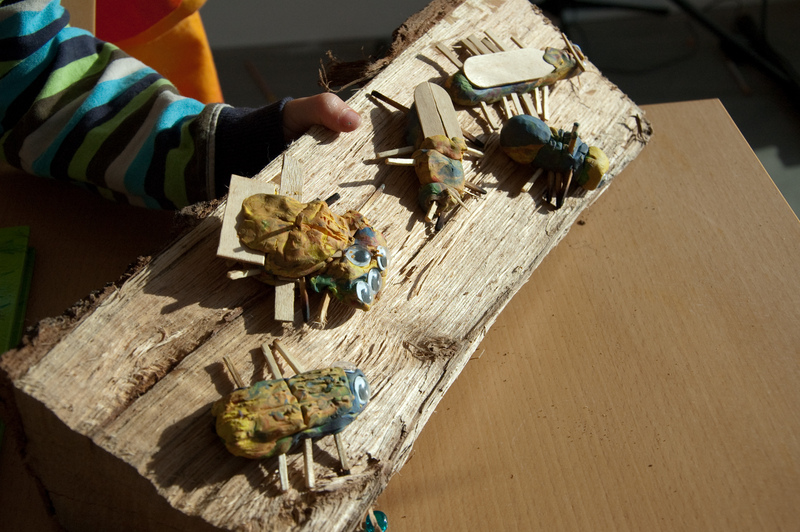 Just think bugs, mud, danger and experiments that fizz a lot and make the occasional smell. The nastier smell the better. That’s pretty much every 6 year old boy’s dream school. Eeeeeaaasy. Loves ya.